On one hand these are a cartoon monstrosity, with a dull and lifeless logo. 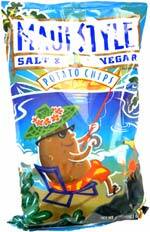 On the other hand: Hawaii, bright colors, sunshine, Maui, tropical shirts, palm trees, vacations... FritoLay are conjuring an image here. And to do it, they have a fishing potato! Fantastic. Product pitching and placement can sometimes be more important than design quality. These Chips were thicker than the average Regular Chip. There were some good shapes to bite into, but most importantly the oil infused thickness made for a reliable and consistent crunch with a loud crash. These Chips were sliced more thickly than regular Chips. There were also some curly and irregularly shaped Chips in the bag. There wasn't much seasoning about, but the Chips were a nice crispy yellow color, with a few brown areas. A Nose Plunge Test aroused a sneaky Vinegar aroma. There wasn't that much vinegar in the combo, but then there wasn't that much salt either. So, it would arguably be fare to say the partnership combined fairly well.